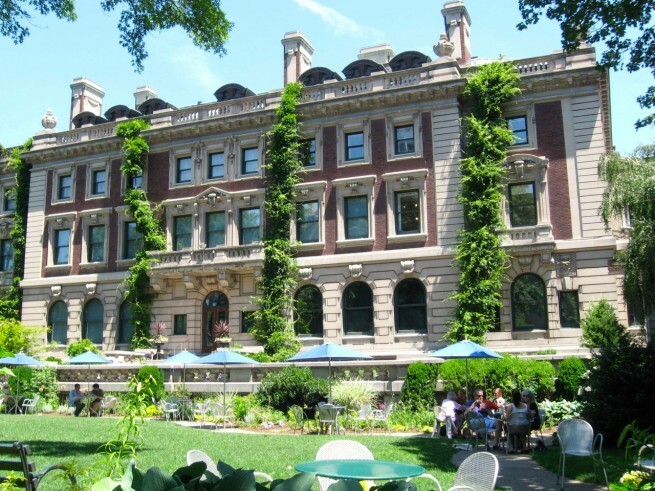 New York’s Cooper Hewitt Smithsonian Design Museum is the nation’s only museum devoted exclusively to design and its impact on daily life. 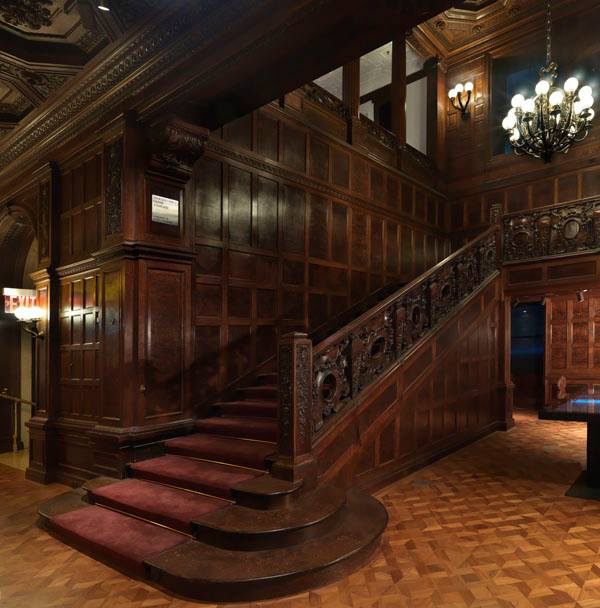 Located in steel magnate Andrew Carnegie’s gilded-age mansion, the historic edifice made history as the nation’s first residence with a structural steel frame and an Otis passenger elevator. The mansion is still making history as the first museum to use state-of-the-art technologies and immersive experiences. Sarah and Eleanor Hewitt, founders of the museum, wanted it to be a “practical working laboratory.” Thanks to the modern technology, some amazing creative talent and innovation, the museum is indeed an interactive laboratory! 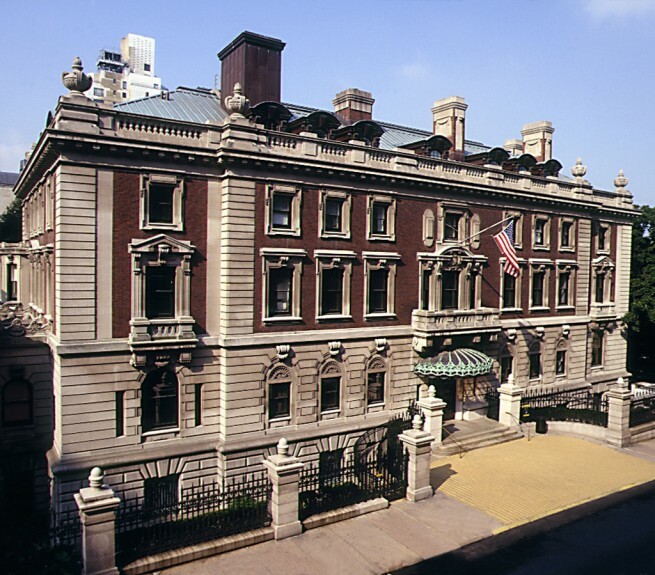 The Cooper Hewitt is located at 91st Street and Fifth Avenue. Subway: 4, 5 or 6 train to 86th St. and Lexington Ave., or the 6 train to 96th St. and Lexington Ave. Bus: M1, M2, M3, M4 to 5th Ave. and 90th or 92nd St., M1, M2, M3, M4 to Madison Ave. and 91st St. The museum is open 7 days a week, 10 am to 6pm (9pm on Saturdays). The Cafe and Gardens are free to all during museum hours. Admission ranges from 9 to 16 dollars. Children under 18 years are free. 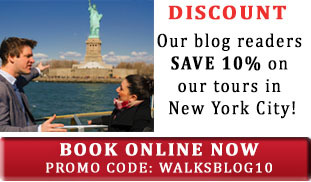 There is a $2 discount if you purchase the tickets online. The Pen: Although it feels like a regular, although a bit large, pen; it is anything but. 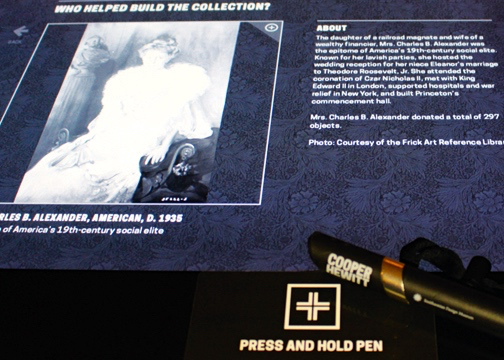 This new high-tech device was designed specifically for the Cooper Hewitt and enables its visitors to interact with the museum on a deeper and lasting level. The pen allows you to interact with walls and tables around the museum and then relive those experiences when you get back home. You receive your Pen when you purchase your ticket and it allows you to collect objects from around the galleries, it also serves as the device you use to create your own objects in all of the interactive surfaces around the museum. When you return your Pen as you exit all the objects you collected and created are uploaded to a website that is accessible to you, using the numbers on your admission ticket, as soon as you get home. The Immersion Room: Ever wanted to design your own wallpaper and then see it instantly come to life on the walls of the room? Well here is your chance. The Immersion Room allows you to not only browse through Cooper Hewitt’s extraordinary collection of 200+ wall-coverings but it also allows you to design your own wallpaper and see it instantly fill up the walls of the room. Some of the wallpapers from the Cooper Hewitt’s collection even come with a story. When you pick these particular designs to project on the walls, the walls start speaking. An audio clip explaining the wallpaper’s history and significance is played through the speakers around the room. The Process Lab: Whether you are a novice to design or if you have been designing for years the process lab is a great place for some real hands on design experience. The space guides you through the process of finding and building a design solution. You can see different design solutions come to life and even try your hand at some brainstorming. The Process room has hands on and digital activities that help you understand what goes on being the scenes of a product’s design process. You go through four categories: getting and idea, prototyping, critiquing and eventually evaluating your design ideas. The Teaspoon Collection Room. Photo: Lilit Kalachyan. The Teaspoon Gallery: This is where you can see all of the museums newest acquisitions, including the Floating Vessel Vase and the Build the Town prototype block set. Hand-sculpted and hand-painted porcelain frit vase with blue glaze. A prototype toy block set with 43 blocks and 9 cars. Blocs hand painted in white, light blue and orange. Cars painted with orange, blue, gray, white and red. 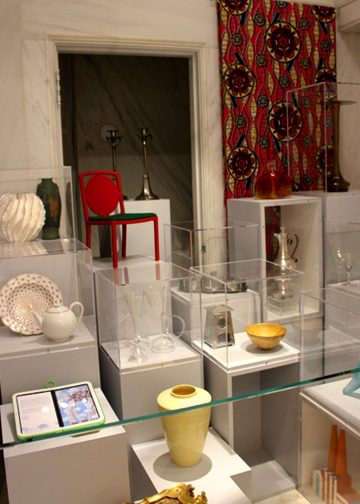 Have you visited the Cooper Hewitt Museum? What was your favorite exhibit? Tell us in the comments below. I’ve never though it can look inside even better than from outside. I will definitely visit this museum.